Crowd or Camera Communications Consulting – Effectively helping your craft & convey your message whether if be in front of a Crowd or Camera. 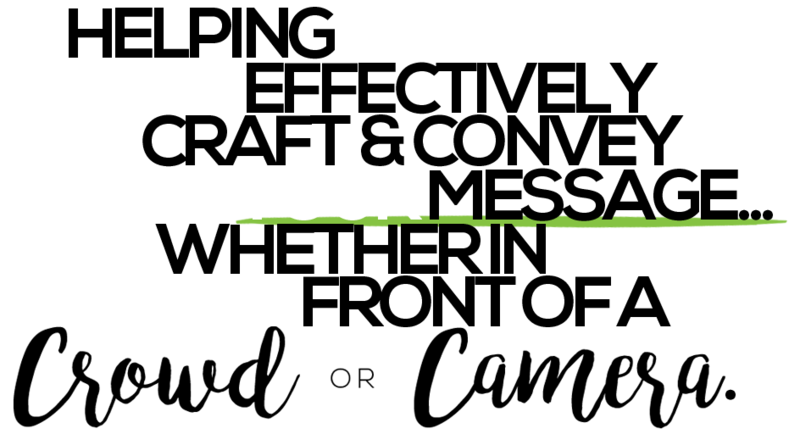 Crowd or Camera Communications Consulting is a boutique brand messaging firm that specializes in tailoring exactly what you want to say to the audience you want to say it to. Media and PR connoisseur Kyla Woods leads the team with over 12 years of experience in media, promotions, and social networking. Crowd or Camera employs realistic and applicable presentation, public speaking, and interviewing strategies that will transform the way you represent yourself and your brand. 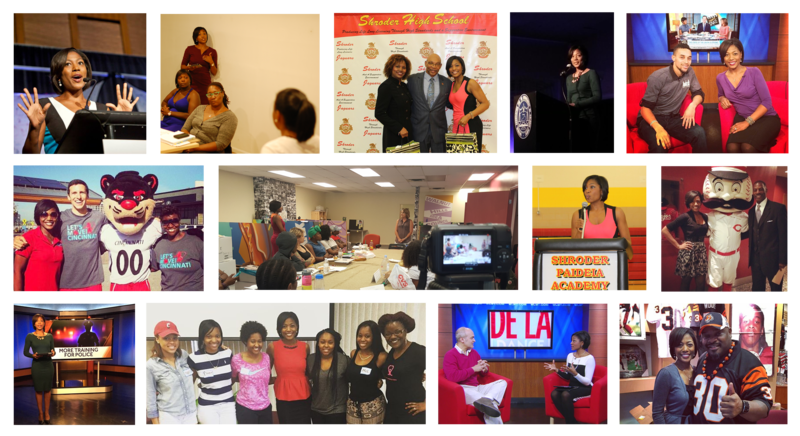 Crowd or Camera Communications Consulting was birthed out of Kyla’s desire to help people communicate effectively. While working in broadcasting, she would often interview business owners, PR professionals, athletes, politicians, community members, and many others who would be perfectly comfortable talking to her off-camera, but once the camera went on or they were in front of a crowd of people – things would totally take a turn. Lost train of thought, sweat, nervousness, and lack of normalcy would try to rob the interviewee of their ability to shine. Kyla found that once she simply engaged that person in a way that made them find their comfort zone, realize the power that lies in the story they have to tell, and tap into the desire that we all have to relate to others in a way that is informative, inspirational, or entertaining – lives were changed. Most people who shared this experience would say “Wow, you made me feel so comfortable. That was so easy.” That’s when Kyla realized that she had a gift; one that could be used as a service to connect people with their inner awesome communicator. Who wouldn’t want to do that? Kyla realized that public speaking, presentation skills, and interviewing were not only services that could be offered to individuals, but to groups and companies as well. In recent years, she has worked with numerous entrepreneurs, including many from Mortar Cincinnati, in preparing students in each of their classes for the organization’s “Pitch Night”. Kyla often works in a group or workshop setting, allowing each student to present individually and receive customized feedback and applicable communication techniques. Why is “customized” in italics, you ask? Because the work that we do is tailored just for you. There is no cookie-cutter approach to mastering your method of communication. What works for you won’t work for the next person and vice versa. That’s why Kyla also offers one on one sessions for those of you who need a ”personal trainer” – communications style. In working with small businesses, Kyla developed a passion and unique perspective for working with nonprofits and entrepreneurs in helping them navigate and market themselves in the startup scene in a way that is authentic and engaging. Crowd or Camera Communications Consulting also offers social media management services (company contracted or event specific), allowing a brand or business to benefit from her years of expertise in content creation and network engagement. 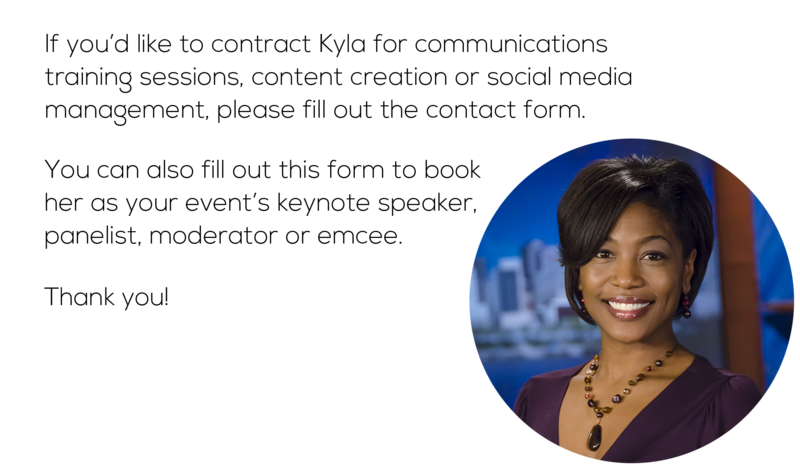 If you, your business, or someone you know is ready to take their communication game to the next level (and WIN), please fill out the contact form and Kyla will get back with you soon. Maybe you don’t need training. Maybe you need someone to help you manage on-site social media for your awesome brand (because the world deserves to know how awesome it is). How often do you find yourself running every aspect of an event, and then looking back on the day later that night, realizing that you didn’t share its significance or document the most important moments? Crowd or Camera will manage your social media at the event, posting on your behalf from designated accounts. Content will be informative, engaging, and entertaining. And it will be one less thing (or ten less things) for you to do. I’ve had the pleasure of working with Kyla Woods over the past year through our involvement with MORTAR Cincinnati. I’m a member of the third class, Cincy Masterminds, and graduated from the business accelerator in December 2015. Kyla was a presenter during the course and shared her personal story, in addition to providing tools for developing our business pitch. She provided one on one coaching to my entire class, ensuring we all had the confidence to deliver the perfect pitch in front of an audience of over 200 people. Her feedback was incredible and enabled me to overcome stage fright, not only becoming a more effective presenter, but encouraging me to seek out additional opportunities to share our story. With Kyla’s help, I’ve been featured on four different news outlets over the course of six months for a total of eight segments. Additionally, I shared my journey as a new small business owner with an audience of 300 people just recently, under her instruction. She has provided insight before each taping, and given constructive feedback as necessary… empowering me to be myself on camera. The support Sweets & Meats BBQ has received from the media and other outlets has been outstanding. Furthermore, I’ve attended several events where Kyla has been the MC. She relates to people and is truly a joy to work with. She’s professional, courteous, has a great personality and is not afraid to control the audience. She shines on the stage and has made every event even more enjoyable, because her smile and positive delivery are contagious. I’m pleased to recommend Kyla’s services to others. She’s been an incredible resource to me personally and many other graduates of MORTAR Cincinnati. Not only is she one of the hardest working people I know, she has character. She is truly passionate about her work and anyone would be very lucky to have her on their team. Kyla is the consummate professional. Whether speaking to a large crowd, a small group, or an individual, she communicates in an authentic and sincere way, using her charisma, sense of humor & positive energy to communicate her message and relate to her audience. Crowd or Camera helped take me – someone who was terrified of public speaking – to someone who has become as comfortable speaking in front of an audience as I would with an old friend sitting on a park bench chatting away. Thank you for giving me the skills and confidence to overcome this fear I had of public speaking. Kyla Woods and Crowd or Camera are AWESOME! Kyla is one of my favorite people to work with. She has the ability to pick up on the tiniest nuance and deliver coaching in a manner that is encouraging, deliberate, but most of all, helpful. I have witnessed her coach individuals who couldn’t talk about their businesses in two sentences without a mistake into refined, professional presenters. I often tell Kyla that she’s “the real MVP” and I mean it, she’s one of the brightest stars we have in the region. Crowd or Camera Communications Consulting, thank you for everything you did to help me. You are so great at what you do and people NEED what you provide. Over the past year, I have observed Kyla prepare about 50 participants in an entrepreneurial accelerator, MORTAR, for their investor presentations at Pitch Night, the program’s culmination. A very high majority of the participants have no experience in public speaking, are extremely nervous, and possess no confidence in their ability to deliver an effective presentation. In helping the participants prepare, Kyla has been consistently positive, upbeat and encouraging while still being able to effectively provide the feedback necessary to “make it right” and offer suggestions for improvement. As a result of her coaching, I’ve witnessed people deliver their presentations with a level of poise, polish and confidence that they didn’t know was within their capabilities. The transformations have been amazing. Kyla is a complete joy to work with. It was obvious from the beginning that she took the time to research my business prior to our meeting, which allowed us to hit the ground running from the moment we met. In just two hours of working with Kyla, I was able to GREATLY increase my confidence in front of the camera (or in my case, the mic). I feel like I’ve found a secret treasure chest full of knowledge that will take my public speaking skills to a whole new level! I can’t wait to work with Kyla again (and again! ).